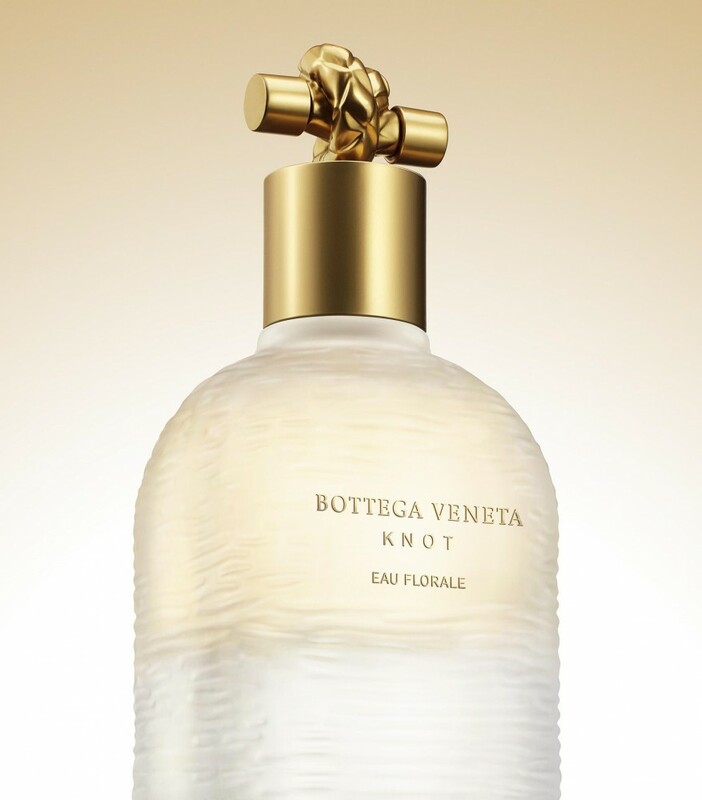 Bottega Veneta introduces Knot Eau Florale, a new fragrance for women launched in partnership with Coty Prestige. A continuation of the original Knot fragrance (inspired by an escape to a villa on the Italian Riviera), Knot Eau Florale represents the next chapter of the Mediterranean interlude, this time set in the villa’s flower garden. The house sits in the hills overlooking the sparkling sea, its interior illuminated by sunlight, its open windows ushering in the saltwater breeze and the scent of peonies from the garden combined with the redolence of clementine trees in the distance. Blossoming with fragrant roses and peonies, the garden is a private sanctuary that feels intensely alive, yet refined in its expression. A walk among the sun dappled garden paths, savoring the light, the air, and the verdant landscape – the moment may be fleeting but the memories it creates are eternal. The Knot Eau Florale bottle - inspired by Venetian glasswork and the traditional Italian carafe - mirrors the rounded curves and clean lines of the signature Knot flacon, now rendered in pale, frosted striated glass that lends the bottle a subtly hazy quality, like sunlight through mist. The cap, meanwhile, remains the bottle’s most distinctive design element: a gold, knot-shaped closure that recalls the closure of Bottega Veneta’s Knot clutch. American fine art photographer David Armstrong to capture the pure, soft and floral fragrance of Knot Eau Florale. The image, which features model Julia Nobis as for Knot, reflects the late photographer’s intimate yet reserved approach to portraiture and captures a casual while still sophisticated style. Tomas Maier joined Bottega Veneta as Creative Director in June 2001. With long experience at fashion and design, he arrived to spark a renaissance at the venerable Italian brand. Committed to craftsmanship, understatement, and refinement, Maier began by drawing upon the deep bench of artisanal talent in Vicenza to craft leather goods of the highest quality. In the years since, he has established Bottega Veneta as a luxury lifestyle house, consistently matching hand workmanship to timeless design, tradition to innovation. Discretion, quality, and unsurpassed craftsmanship--Bottega Veneta has established a new standard of luxury since its founding in Vicenza in 1966. Steeped in the traditions of Italy’s master leather craftsmen and renowned for its extraordinary leather goods, Bottega Veneta stands for individuality and self-confidence, a philosophy expressed in its famous motto, “When your own initials are enough.” The principles that define the brand are unchanging: outstanding craftsmanship, innovative design, contemporary functionality, and the highest quality materials. Also constant is Bottega Veneta’s commitment to its ateliers, where artisans of remarkable skill combine traditional mastery with breathtaking innovation. Indeed, there is an unusual and inspired collaboration between artisan and designer at the heart of Bottega Veneta’s approach to luxury, a partnership perfectly symbolized by the house’s signature intrecciato woven leather.